The Celtics Jaylen Brown is having a hell of a time in Indonesia. He is learning Martial Arts there, and who knows where that might go. It landed Kareem Abdul-Jabbar in a Bruce Lee movie, and I am not sure 5'6" against 7'1" is even close to fair, but Lee could defeat almost any opponent. One female fan of Brown's almost hyper-ventilated when she met him in Indonesia. You can hear a bystander call out, "Don't faint". Looked like it was a close one. 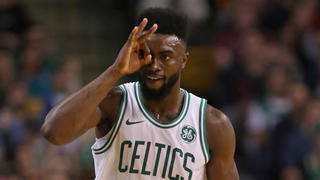 One of the many things I like about Jaylen Brown is that he goes about any task or endeavor with zero fanfare. He and Marcus Smart are similar in that way. I mean, he wasn't up on stage performing as a heart-throb rock star when the female fan almost passed out from emotion. He was just standing there quietly. Some guys just have it.